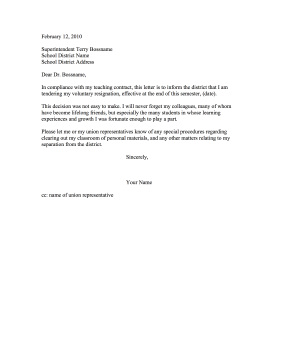 Notify administration, unions, and school boards of departure with this teacher resignation letter. In compliance with my teaching contract, this letter is to inform the district that I am tendering my voluntary resignation, effective at the end of this semester, (date). This decision was not easy to make. I will never forget my colleagues, many of whom have become lifelong friends, but especially the many students in whose learning experiences and growth I was fortunate enough to play a part. Please let me or my union representatives know of any special procedures regarding clearing out my classroom of personal materials, and any other matters relating to my separation from the district.